This medium-sized yellow morel is known from the southeastern United States, where it appears to be limited to association with tulip trees. 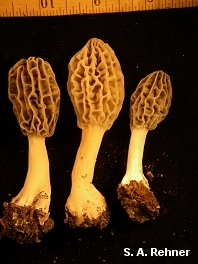 It is similar to the more widely distributed Morchella diminutiva; like that species, Morchella virginiana has vertically oriented pits and ridges--but Morchella virginiana is a little larger than Morchella diminutiva when mature, and its cap is more egg-shaped and a less conical. 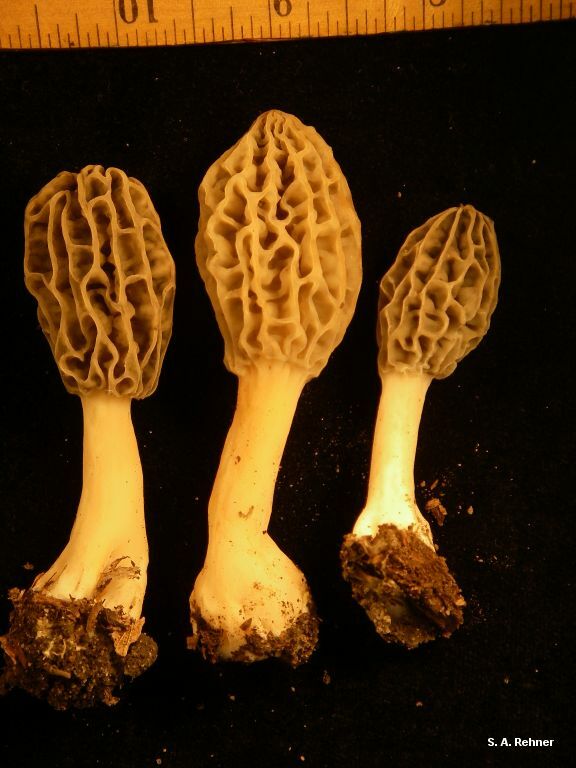 Morchella esculentoides is also similar to Morchella virginiana, but is usually larger, and features randomly oriented pits and ridges, as well as a proportionally stouter stem. Ecology: Possibly saprobic and mycorrhizal at different points in its life cycle; growing alone, scattered, or gregariously under tulip trees in river bottoms, coastal plains, and drainage areas, often in sandy soil; April and May; southeastern United States (DNA verified from Mississippi, North Carolina, South Carolina, and Virginia). Cap: 3-7 cm tall and 2-3.5 cm wide; egg-shaped, with a rounded or bluntly conic apex; pitted and ridged, with the pits primarily arranged vertically; when young with flattened, bald or finely velvety, yellowish ridges and grayish brown pits; when mature with sharpened or eroded, brownish yellow to yellowish brown ridges and similarly colored pits; attached to the stem directly, without a groove; hollow. Stem: 2.5-6 cm high and 1-2 cm wide; more or less equal, or sometimes a little swollen at the base; whitish to pale yellowish; bald or finely mealy with granules; hollow. Microscopic Features: Spores 18-25(-28) x 10-16 µ; smooth; elliptical; without oil droplets; contents homogeneous. Asci 8-spored. Paraphyses cylindric with variable apices; septate; hyaline to brownish in KOH. Elements on sterile ridges scattered and infrequent (often difficult to locate or distinguish from paraphyses); 100-175 x 10-30 µ; septate; hyaline to brownish or brown in KOH; terminal cell widely cylindric, with a rounded, subclavate, subclavate, or subfusiform apex. SPECIMENS EXAMINED: Herb. BPI 880503 (holotype), 880504. Herb. F. 04280301, 04110402, 05010405. Kuo, M. (2012, November). Morchella virginiana. Retrieved from the MushroomExpert.Com Web site: http://www.mushroomexpert.com/morchella_virginiana.html.